There is no doubt that this is a horror movie. It's horror, plain and simple. Not a "comic book adaptation" or fantasy or sci-fi...this is horror. But they made it PG so it doesn't have the graphic violence or gore that you'd expect from such a thriller. The horror here is mostly psychological. And who is better at mind games than the British? This being a British-made film based on an American comic book series is interesting within itself. But before you click off this page, thinking that "Oh, British. Well, this is going to be dull as hell," pay attention. This is NOT boring by any measure of the imagination. Stuff happens swiftly and coherently. There isn't a lot of fancy talk, and the acting is out of sight! You can understand everything they're saying or doing. There is nothing that is "over our heads". They made this with a very generalized appeal. In doing so, they also made it timeless, for it is not bogged down with early 1970s fads or buzz phrases. As a matter of fact, if a person doesn't know it's from 1972, you'd almost think it was made much more recently. Like mid-1980s. It's very beautifully shot. Brilliant filming, all in color. It doesn't really look that dated except for maybe hairstyles, but that's all very minimal. I think this movie will hold up even 20 years from now. But the way it's done is timeless. Five people, all strangers to each other, are mysteriously drawn to the same tourist attraction: an ancient catacomb. They get lost from their tour group and wind up in a mysterious chamber, sealed from escape! It is there that they meet a strange hooded figure by name of "The Crypt Keeper". Before I go any further, let me tell you a little something. The Crypt Keeper of this film is made to look human in a monk-like robe. He is not the gruesome corpse version of the character made so popular by the 1989 TV series. He doesn't cackle maniacally. Actually, he's quite cool in his speech. Very foreboding and calculating. 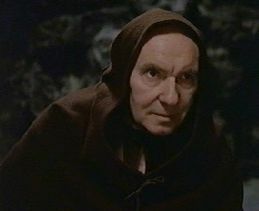 The Crypt Keeper is played by Sir Ralph Richardson. He is a very smart actor in this film and does a great job. In the classic EC comic books, the Crypt Keeper looks a bit more human than his much later TV counterpart. So this, truthfully, is not so much of a stretch from that character. He's an older, very human-looking man in a robe. TVs Crypt Keeper is made to be a lot more gross-looking, which works for the series. But for this movie, it was just better that he looked human. It left an air of mystery throughout the whole picture as to who or what he was. The Crypt Keeper tells each one of his visitors a most accurate prediction of what they are capable of doing in the future. It turns out that all five of these lost tourists are, indeed, evil to the core. The future visions are shown to us through five separate mini-features, all ranging from 11 to 18 minutes in length. Each story starts out with the respective "visitor" doing something wrong at a time after they leave this place. Then, in the story, the wrong-doer meets a most grisly, but deserving, end. So the Crypt Keeper scares the s*** out of everybody, right? What happens from there? Well, they're free to go. Go, that is, into a fiery pit! Crypty was not warning them, he was telling them...why they were going to Hell. So is the Crypt Keeper really the devil, or someone working for the devil? The answer is not given, but we do find out that he is responsible for passing judgment on these misguided souls. When you see the end of this movie, you will never forget it. Sir Ralph Richardson leaves quite an impression when he breaks the fourth wall for the first and only time in the movie and asks, "Who's next? Perhaps...you?" The grim spectre of death will literally chill your bones. I think any kind of person would enjoy this film, whether it be a metal-head or an intellectual. Try it. I know you'll like it if you're at all interested in thrillers. The first story of the film: "And All Through The House". Joan Collins is the star. She kills her husband for his hefty insurance policy on Christmas Eve. The wife plots to make his death look like an accident, while keeping it from her young daughter who is sleeping upstairs. But while this is going on, a serial killer that dresses like Santa Claus is on the loose. And it just so happens that he is outside Joan's house! Well, she can't call the police for help because of her murdered husband's body, so what can she do? She does her best to keep the killer Santa at bay, but whilst working on her husband's "accident", her daughter lets "Santa" inside. And that is how her story ends. "Reflection of Death" makes things a might creepier. Ian Hendry is the star. He leaves his wife and kids to run off with his mistress Susan. A quick side comment: Angie Grant, who plays Susan Blake, is a really attractive and engaging actress. While Hendry and Susan are driving off to who knows where, they get into a fiery car accident. The next thing Ian knows, he's walking around town looking for help, for Susan, for anybody! But everyone runs from him and he doesn't know why. He makes his way to his wife's house. She freaks out when she opens the door and shuts him out. He also discovers that her married name has changed from Maitland to Wilson by the sign on the house. So now he's really confused. Ian arrives at Susan's apartment. She's not afraid of him, but that's because she is blind. She tells this "stranger" that it can't possibly be her Charles (that's Ian's character name) because he died in the same car accident that blinded her over two years ago! He finally sees his reflection and sees a badly disfigured face. His scream is the last thing we see. "Poetic Justice" is cool. Robin Phillips is the malicious rich boy. Peter Cushing is the good guy that gets done wrong. Robin hates Peter, who is a poor junkman living in his well-to-do neighborhood. So he does everything in his power to discredit Peter and drive him out of town. Everything that hurts the most. But Peter hangs himself. A great enthusiast of the occult, Peter comes back from the dead exactly one year after his suicide. The zombie learned who was the mastermind of his psychological torture and paid Robin a visit to his house late at night. Robin's father finds him at the morning, at his desk, with his heart ripped out of his chest! Peter's zombie is long gone, nowhere to be found, but there can be no question to the father as to who did this and that Robin has paid for his ruthless treatment of his once kind neighbor. 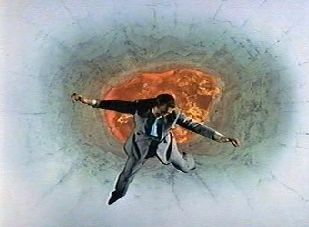 Richard Greene, at one time TVs Robin Hood, stars in "Wish You Were Here". But he's not a charming prince of thieves in this film. He's a ruthless executive whose lifetime of scheming has backfired on him and found him on the brink of bankruptcy. Relying on an ancient Chinese statue he purchased, his wife wishes for lots and lots of money. This is the first of three wishes as the statue's inscription implies. She gets her wish, in an unfortunate way. Richard dies of a heart attack while driving when he sees a skeleton driving the motorcycle behind him. The Grim Reaper, perhaps? Anyway, his car crashes and everyone assumes that he just died because of the crash. His wife wishes him back from the dead, just like he was immediately before the crash. That's how she found out that he died of a heart attack, as mysterious pallbearers from out of nowhere bring him into the house in a coffin and then leave. She then wishes that he was alive again and that he would never die. Richard comes back to life, but the embalming fluid in his body is burning his insides! She didn't take the embalming fluid into consideration. She tries to kill him by hacking him up with a sword, but he cannot die! So he's alive for all of time, in pieces, and eternal pain! That's some freak stuff. Last, but not least, is "Blind Alleys" starring Nigel Patrick. He plays an ex-Army Major who has just become the superintendent of a Home for the Blind. Although he provides himself and dog Shane with every luxury, sparing no expense, he is a real tightwad when it comes to the well-being of the blind people. He allows them no heat on cold nights, no extra blankets, and bad food (not even second helpings at that) all because it's "not in the budget". But when one of the blind people die due to Nigel's penny-pinching ways, the spokesperson for the blind, Cutter (played by Patrick Magee), leads a horrible revolt. Nigel and his dog Shane are locked in separate rooms for days without food and drink. Shane, a German Shephard, grows wild and ruthless from his hunger with each passing day. Nigel is finally released, but finds that a tunnel has been constructed going from his room to Shane's. Shane has also been released. And with no way out, the dog tears Nigel to bits! There's actually much more to this story, and all of these stories, then what I tell you, but this is the brief rundown. So when all five of these people are condemned to Hell, it is preventing the horrible things from happening to the innocents. Cool! Joan Collins in And All Through the House segment (1972). Sir Ralph Richardson as The Crypt Keeper. 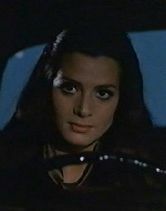 Angela Grant (Angie Grant) as Susan Blake in Reflection of Death segment. 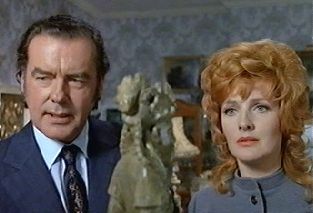 Richard Greene & Barbara Murray as the Jasons in Wish You Were Here segment.